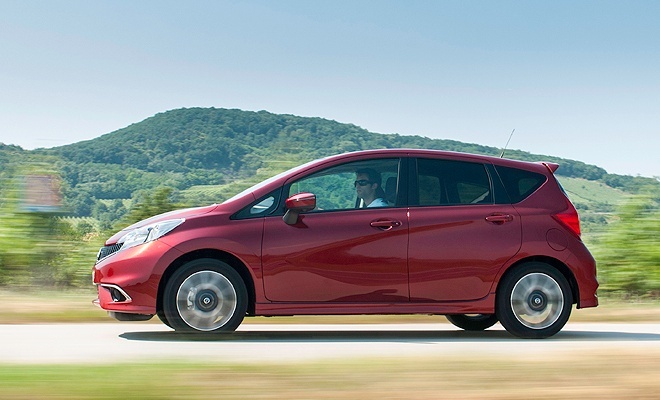 Nissan has created a clever safety system for its latest supermini, the new Note hatchback. 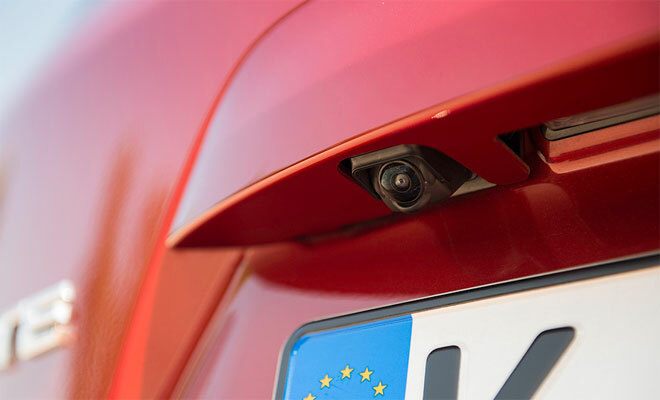 A bulging, frog-eyed lens peers out from under the number plate shroud at the rear, capable of seeing a little way past the corners of the car. 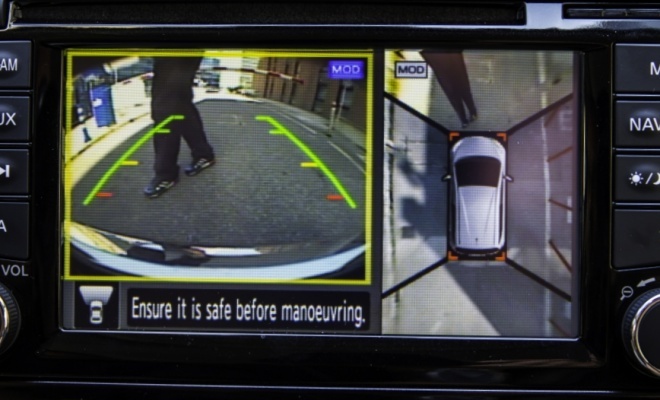 It can perform all the usual reversing camera tricks, but also has a flourish up its sleeve. It can peer sideways to warn of cars and other moving objects in your blind spots, left and right. It’s so much like a real eye it can even shed a tear – albeit a blue-tinted drop of windscreen wipe solution. To keep its view clear in grimy road conditions the lens has its own washer jet, plus a tiny air compressor to blow-dry it clean. Together with a trio of other little lenses, better equipped versions of the new Note can provide a full 360-degree view on the centre-console screen, arranged as a top-down, bird’s eye view of the car. It’s very helpful for parking or, as I can attest, when dastardly people from Nissan come along and cover up your windows. 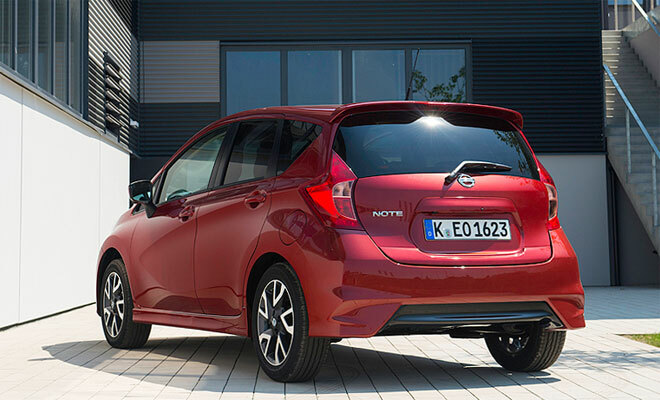 There’s a first time for everything, and my test drive of the Nissan Note was the first time I’d ever needed to drive up to a parking space and reverse neatly in while not being able to see out of the car. I finished the job unscathed by camera view alone, without flattening anyone or too much of the surrounding scenery. I’ve been looking forward to testing the Note for quite a while. It’s based on the 2012 Nissan Invitation concept car, and the look of the show vehicle has made it onto the road largely unscathed. It looks neat and purposeful and poised for action from every angle, even if it does look more like the lovechild of a Peugeot and a Ford than any close relation of the Nissan family. Not looking like the Nissan Micra is a good thing, of course. Even after its recent and thorough facelift, the Micra would never land a job reading the news on TV. What the Note does share with the Micra is an interesting engine. The supercharged, three-cylinder DIG-S petrol unit is a peach in the Nissan fruitbowl, and remains the only reason to buy a Micra. It develops 98PS (97bhp) and 147Nm of torque from a modest 1.2 litres, and does so while emitting the kind of entertaining noises you used to make lying belly down, pushing toy cars along the carpet as a child. By which I mean the thrummy engine sounds you heard in your head, not the slobbering sound of flapping infant lips that others might have witnessed. The Note is also amazingly spacious inside, with more legroom than most cars a size or two bigger, courtesy of a wheelbase about a hands’ span longer than average. 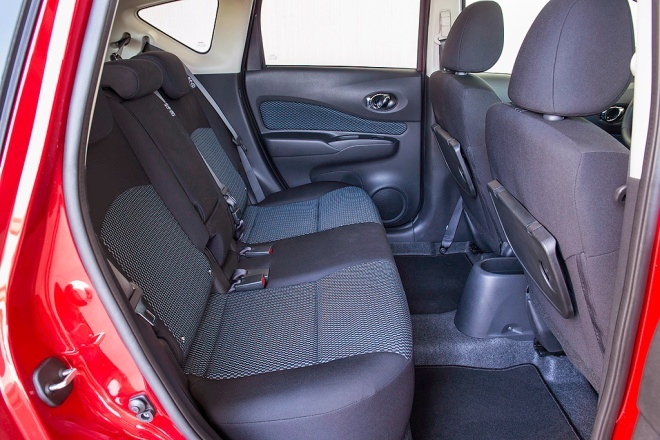 The boot is a good size too, and on some models the rear bench slides to trade legroom for luggage space. Sadly other aspects of the Invitation haven’t quite panned out, and the Note is not quite the car it ought to have been. The main culprit, I suspect, is the need to get under 100g/km. 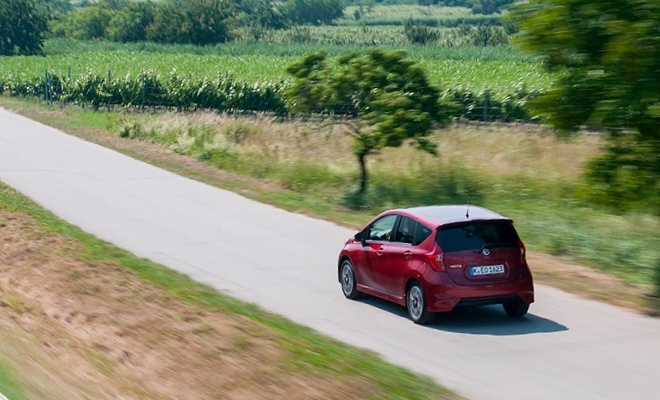 Yes, the petrol-powered Note boasts a 99g/km score, but no, it’s not very nice to drive. Like many of the earliest green-label specials, this car has gearing that feels all out of kilter. The actual cogs in the five-speed manual gearbox are probably OK, but the final drive ratio is clearly too long. As a result, it’s much too easy to select a gear in which flooring the accelerator makes no detectable difference to progress. In common with most supercharged engines, the DIG-S needs a few revs to start breathing properly, and the gearing the Note is lumbered with definitely doesn’t help. The only solution is to use one gear lower than you otherwise might, which is far from ideal. 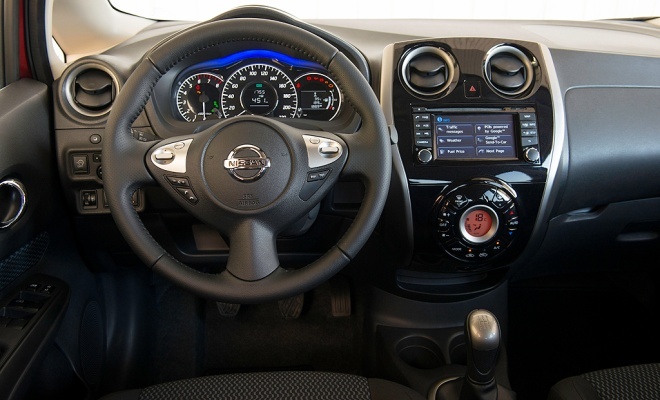 There’s an eco button down by the gearstick that softens throttle response (as well as illuminating a blue lamp over the instruments), transforming the car into an even more intractable slug. Other disappointments centre on the quality of cabin plastics, some of which seem to be cast-offs from the Fisher-Price factory. Evidently the interior has faced an austerity plan of which only George Osborne might approve. Clearly not everyone within Nissan is convinced either. Over dinner I happened to mention to one Nissan VIP that I could see bolt-heads in the Note that I couldn’t see in other cars. Much to my embarrassment a product manager was summoned and I was pointedly asked to repeat my criticism. The next morning, the bolts were disguised with vinyl and glue, and I was told that the design would be changed for production. You can order a new Note today, but the first production cars won’t arrive till October. As a result of my nitpicking, someone in Sunderland – where the Note is being built – will probably land a job. And if the Note fails to make a profit by a few pence a unit, I’ll be the one Nissan can point to and blame. The Note can be chosen with engines other than the DIG-S, including a lower-powered 1.2 petrol that really doesn’t sound wise, and a 1.5-litre dCi diesel that yields 90PS and 200Nm of torque, with a CO2 score of 95g/km. Getting to 62mph takes the DIG-S car 11.7 seconds, while the dCi requires another two tenths of patience. There’s also a CVT automatic gearbox, though for my money the manual DIG-S edition is the only Note of note, if you’ll pardon the expression. Prices for the DIG-S car are reasonable though not quite keen, starting at £14,250 in mid-range Acenta trim, or from £15,950 in top-of-the-range Tekna spec. Nissan says it offers more than £400 of extra kit compared to an equivalently priced Ford Fiesta. 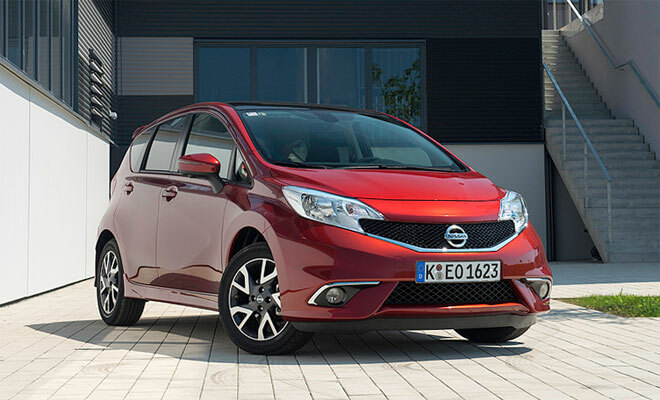 The Acenta boasts neat alloy wheels (16s with the DIG-S engine), aircon, Bluetooth and a sliding rear bench. 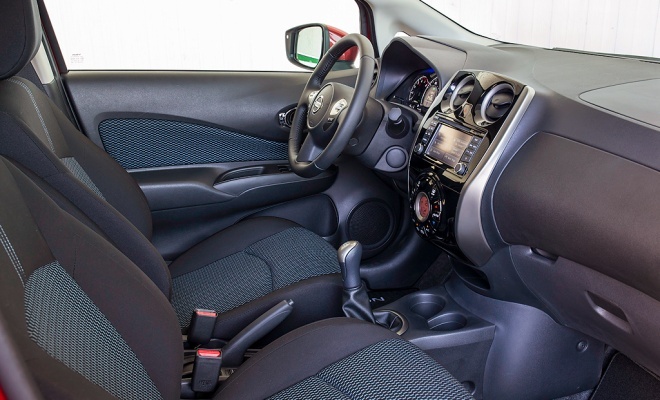 Tekna gains an online infotainment system, climate control, automatic lights and wipers, part-leather seats, the clever cameras, keyless start, and a welcome leather steering wheel among other improvements. There’s also an Acenta Premium trim that sits midway between Acenta and Tekna. As it stands, the Note does provide a few compelling points of interest. I think it looks handsome, it’s very spacious, it offers great technology and it doesn’t rattle. But it seems off the pace in cabin quality and I didn’t really like the way it drives. It’s a nearly-good Nissan, but not quite.